This is an absolutely beautiful fossil Megalodon shark tooth! It has great dark tones and lightly serrated edges. This was designed for the person who wants a large quality shark tooth pendant necklace. All natural, no repairs, very high quality! 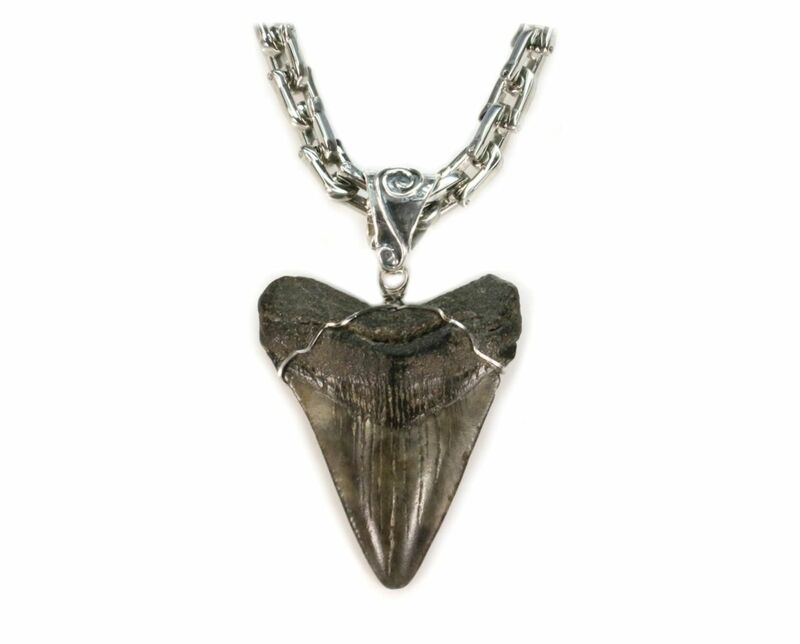 Fossil Shark Tooth size: About 2 1/4" L X 2" W X 1/2" D. Heavy duty 24" stainless steel chain included. The wire wrap for the tooth is non-tarnishing stainless steel. The bail which holds the pendant to the chain is silver with an ornate design. Ships in an attractive jewelry box, information and Certificate of Authenticity. The perfect gift for someone who wants an outstanding, quality fossil Megalodon shark tooth pendant necklace. About Megalodon Sharks: The megalodon is considered to be one of the largest and most powerful predators in the ancient oceans. They are thought to have gone extinct during the Cenozoic, about 2.6 million years ago.